The debate over the pending reform of Spain’s public pensions system hit the campaign trail at the weekend, after Spanish President Pedro Sánchez of the Socialist party (PSOE) called out a leading candidate and economic guru of the rival conservative Partido Popular (PP) for having lauded cuts of as much as 40 percent to public pension benefits for retired workers in other European countries at a time when the Socialists are campaigning to inflation-index the monthly retirement disbursements to the country’s consumer price index. At a Sunday pre-campaign rally in Tarragona in the run-up to general elections just four weeks away, Sánchez called out Daniel Lacalle, the PP’s economic guru and fourth in line behind PP leader Pablo Casado on the general elections candidates list for the PP in Madrid, for having lamented in an interview with the newspaper El Economista that “Spain is the only country that, with respect to other countries that have been in a similar situation, has increased pensions. The rest have reduced them to 40 percent”. Saying the debate about pensions reform in the rest of Europe “is not how much they are revalued, but how much they are cut — 20 percent, 30 percent or 40 percent”, Lacalle appeared to be implying that Spain should be slashing and not increasing retirement benefits. After Sanchez said in Tarragona that the PP seeks to cut pensions to such an extent as to impoverish Spain’s retirees and that the true aim of the conservative party is to privatize the country’s pensions system, Lacalle attempted to backpeddle. But the exchange left the PP reeling and the party immediately went on the attack to counter the damage, calling out Sánchez through the social media hashtag #SánchezMentiroso (‘#SánchezLiar’) to say that the Socialist president was purposely distorting the PP position. PSOE spokesman and the government’s Minister of Development José Luis Ábalos kept up the pressure during a press conference Monday,telling reporters that the Socialists are “disturbed by what the PP is trying to do with pensions”, adding that cuts of up to 40 percent would drop monthly retirement benefits to around 300 euros per month and implying again that what the conservative party would prefer is privatize the country’s pension system. The debate over reform of Spain’s public pensions system appeared to be coming to a close in the last legislative session, with an all-party committee in Congress nearing agreement until failure to pass the 2019 federal budget led Sanchez to call snap general elections for 28th April. That prompted a sudden turnabout in support of the PSOE position from erstwhile pensions ally Unidos Podemos , who introduced a slew of last-minute amendments to the draft accord that sank prospects for immediate reform. Spain’s Constitution mandates that the country’s public pensions system must guarantee monthly payments to retirees that are sufficient to enable them to have a dignified lifestyle, but austerity cuts beginning in 2010 and freezing of pensions payouts during the two successive PP governments under President Mariano Rajoy caused the monthly retirement benefits to fall behind inflation. 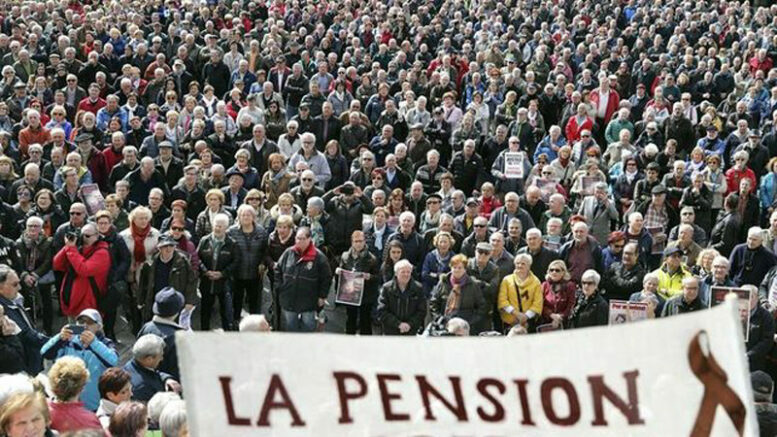 Throughout the last legislative session, associations of pensioners campaigned for the indexing of the monthly retirement payouts to the country’s consumer price index and continue to stage regular protests in all major Spanish cities in support of their demands.